Your audiologist may also give you a Patient Processor Kit before your child’s first appointment. If you have the kit, you need to prepare your child’s processor for initial activation by charging the batteries the day before the appointment. By the time your appointment rolls around, your child will be charged and ready to hear their first sound! The audiologist will use special software to create a customized set of programs for your child’s sound processor. It’s during this process that your child should begin to be able to hear sound. Some children will be able to tell the audiologist what they hear as well as the volume and pitch of sound. If your child is unable to communicate what they hear, do not worry! Your audiologist is specially trained to observe your child’s behavioral responses to sound. Additionally, AB’s software provides your audiologist with a tool to measure the hearing nerve’s responses to sound so that the appropriate levels can be set for the hearing program regardless of your child’s ability to participate in the programming. In addition to devising a rehabilitation plan with your child’s audiologist, you can also utilize The Listening RoomTM, an interactive website for parents and professionals that provides free ideas, materials and support in English to promote active listening and language stimulation. It takes time and practice to hear your best with cochlear implants. It’s important to remember that it is a process, not an instant fix. 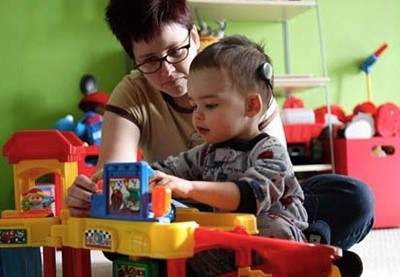 Just as those with normal hearing had to learn to hear, your child will need to practice to learn to hear. You can work with your audiologist for a rehabilitation plan and utilize AB’s resources provided in English in The Listening RoomTM. Bring your child’s favorite toys to the the activation appointment. Fitting the processors and conducting initial programming can take 30 minutes to an hour. Having fun distractions like toys will not only help your child pass the time, but also keep them occupied while the audiologist manages the equipment and programming. During the appointment, it’s also important for you to share with the audiologist your observations of your child’s responses as your input may be very helpful in the programming session. The audiologist will slowly increase the volume and will evaluate your child’s response. The first sounds can produce a variety of reactions, including crying, laughing, looking up, bewilderment, or even ignoring it. Because sound has no meaning to a child yet, they may not have any obvious reaction at first. Should this occur, audiologists apply their specialized training and identify behavior that might otherwise go unnoticed. These important steps will help ensure your child is hearing their best during this phase of their journey to hearing. Your child’s audiologist will guide you in scheduling the next mapping sessions. Typically, multiple mapping sessions are needed through the first few months of your child’s journey. Your observations of your child’s responses will help the audiologist make adjustments, evaluate your child’s progress, and optimize your child’s hearing.